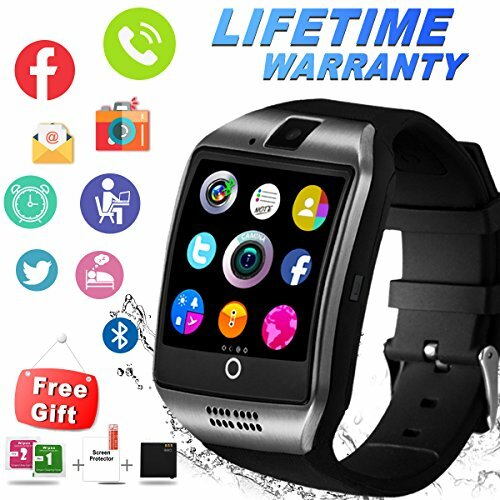 ✅【Multi-Function Smart Watch 】:Dial via watch SIM or Bluetooth optional, Pedometer, Calories Calculation, Sedentary remind, Sleep monitoring, Remote photos, Music playing, Alarm clock, Two-way anti lost remind, voice recorder, muti-timezone, muti-language, daylight saving time and notification push including facebook,twitter, email,calls,texts,etc.For ANDROID,all functions can be used. For IPHONE,the smartwatch supports Partial Functions. ✅【Compatible All Kinds Smart Phone Models】: All kinds of bluetooth smart phones: Samsung Galaxy , Samsung Note, Galaxy C5, C7,C8,C9, SONY, HTC, LG, Google Pixel /Pixel XL, Huawei, Xiaomi, ZTE, Lenovo, OPPO, Vivo and other Android phones, iPhone 8, iPhone 8 Plus, iPhone X, iPhone 7,iPhone 7 Plus, iPhone 6,iPhone 6S,iPhone 6 plus,iPhone 6S Plus, iPhone and so on. ✅【Wearing More Comfortable】:STAINLESS steel surface, Precision laminating process, Nano TPU85 material strap, anti-sweat matte surface treatment, ergonomic convex design and soft strap which make wearing more comfortable. Life Waterproof, the smart watch surface can resist rainwater impact when you are in outdooor. ✅【Works Over Your Expectation】:Easy to connect to your smartphones and Speaker phone works seemlessly.The voice of watch cell phone and smart watch is clear and loud. Listen to music and make calls from your watch Freely. ✅【Long-Lasting Battery life & Extra Replacement Battery】: 350mAH lithium battery, average using time is 2 days. We also give you one piece Free Battery as a Gift. Never worry about out of battery problem. Our smart watch has an awesome display as well as the hypersensitive screen touch, which can supply you the clear display even in the glare. Fashion and modern surface display make your smartwatch more fashion and outstanding. If you have any questions about this product by IFUNDA, contact us by completing and submitting the form below. If you are looking for a specif part number, please include it with your message.